The anticipation of my arrival in Italy was indescribable. I don’t know what I looked forward to most, visiting villas, tasting the cuisine, or just submersing myself into the Italian culture. We arrived in Rome, packed the car and then onward towards the bay of Naples with the magnificent Vesuvius in sight. Even in early evening the Volcano is so daunting. Almost 4 hours and many winding turns later, we faced the beautiful coast of Positano. The aromas around Positano are unforgettable, even being bottled as air fresheners, which we did buy a few to enjoy for months to come. 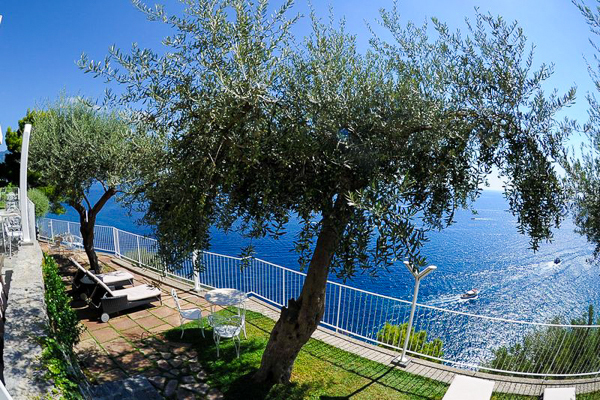 We stayed at hotel Covo Del Sarceni in Positano, where the views from our rooms were absolutely breathtaking. While parking the car and emptying our luggage from the trunk we called the hotel to send us the porters for our bags and me. I was able to talk the guy into taking me on the cart with the bags down to the hotel… little did I know I was going underground! I felt like Phantom of the Opera going underground with the water running across the path to come up on the other side at the beach. I loved everything about this place, the staff was so friendly and we made many friends there. After several nights in Positano, exploring the Amalfi Coast with its' stunning villas and very friendly people, we were off to Capri. We took a ferry from Sorrento which turned out to be a fast and smooth ride. Once on land we found a taxi and were off. Our taxi ride was so cool, large with 3 rows of seats and open-air so we had a blast taking pictures. While driving to Anacapri I couldn’t believe the rugged terrain we covered and the history we discovered. Anacapri, the smaller and quieter town on the island, is a network of pedestrian paths, so our taxi dropped us at a central locale and we took in the scenery on our walk to our hotel which turned out to be a real gem. The gardens were full of lemon trees, bursting with fruit and the aroma was sensational! 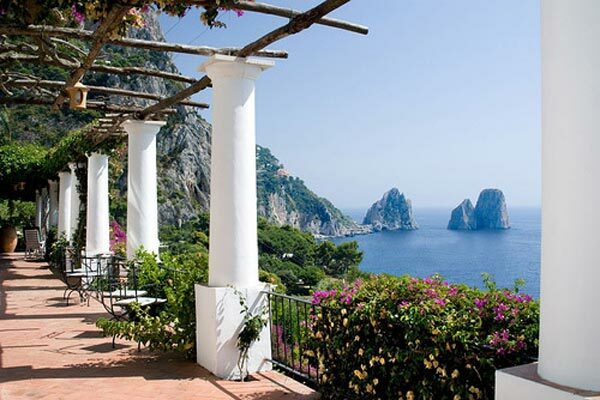 We saw a nice mix of villas on Capri, from 2 to 9 bedrooms. Parking can be tough on the island and really you don't need a car, you can get around perfectly well with taxis. Before it was time to leave, I indulged in a glorious massage under the lemon trees, much needed after all the walking we have done. Then a final lunch, where the fresh lemons were again the star, and we had to say goodbye to Capri.